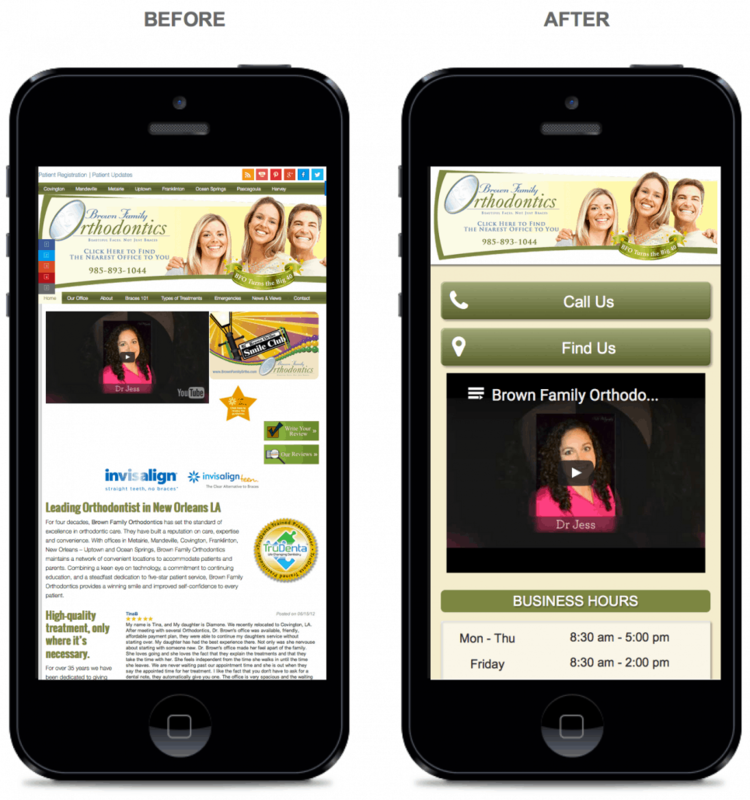 Mobile Website Design & Development - Blend Local Search Mkt. Over 60% of ALL searches are mobile searches. 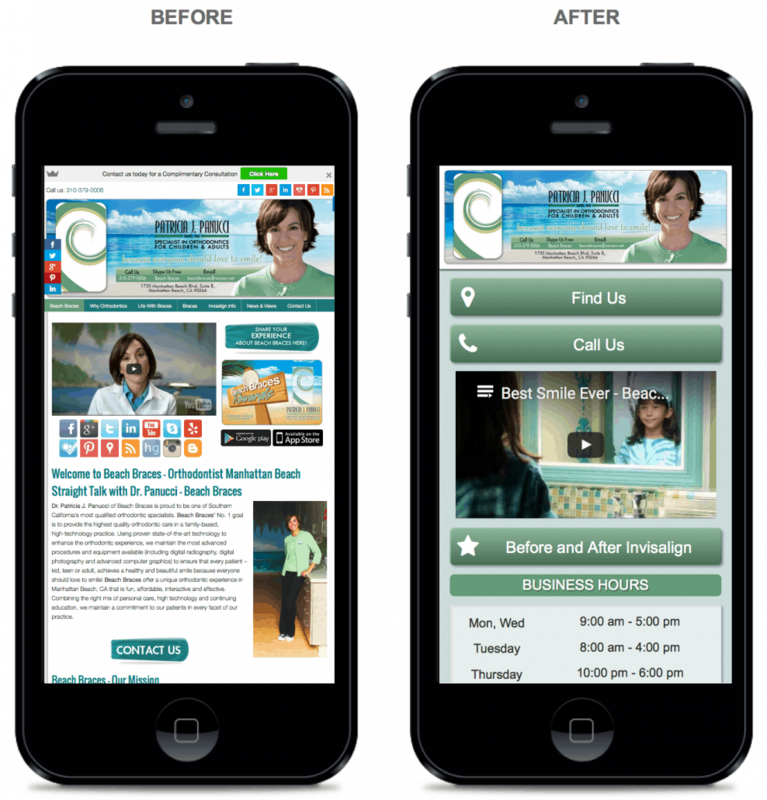 If your website is not mobile friendly YOU WILL NOT BE FOUND IN MOBILE SEARCHES! It pays to be where your customers are, so it’s vitally important that you business can be found via mobile devises like phone, iPads and tablets. Click on the button above to see if your website passes Google’s mobile friendly test. This test will analyze your website URL and report if the page has a mobile-friendly design. 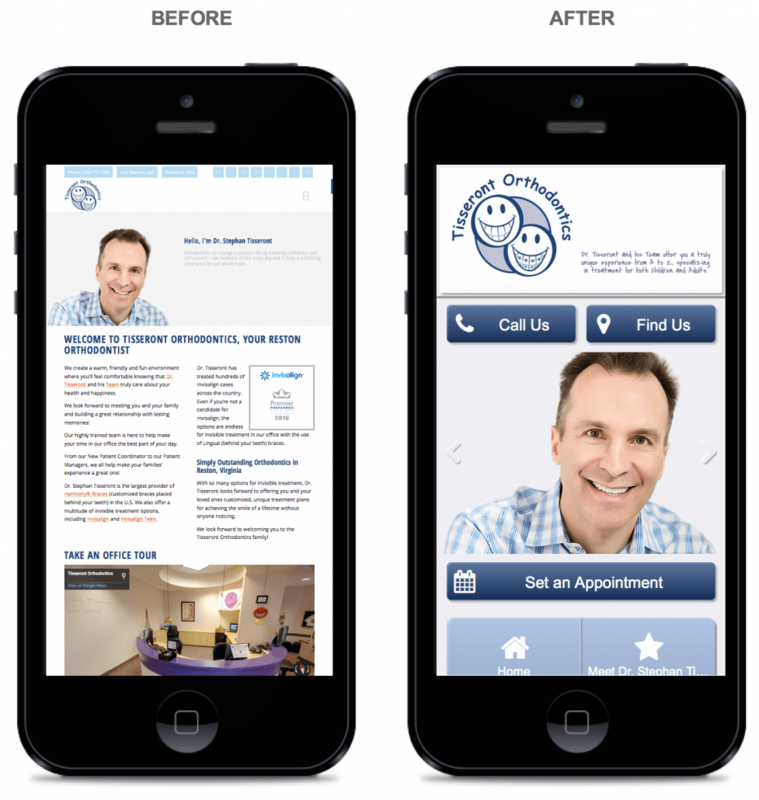 Before – In the above examples we see how a responsive website designed for desktop looks on mobile. This site passes Google’s Mobile Friendly test but isn’t optimized for the end user on a mobile device. 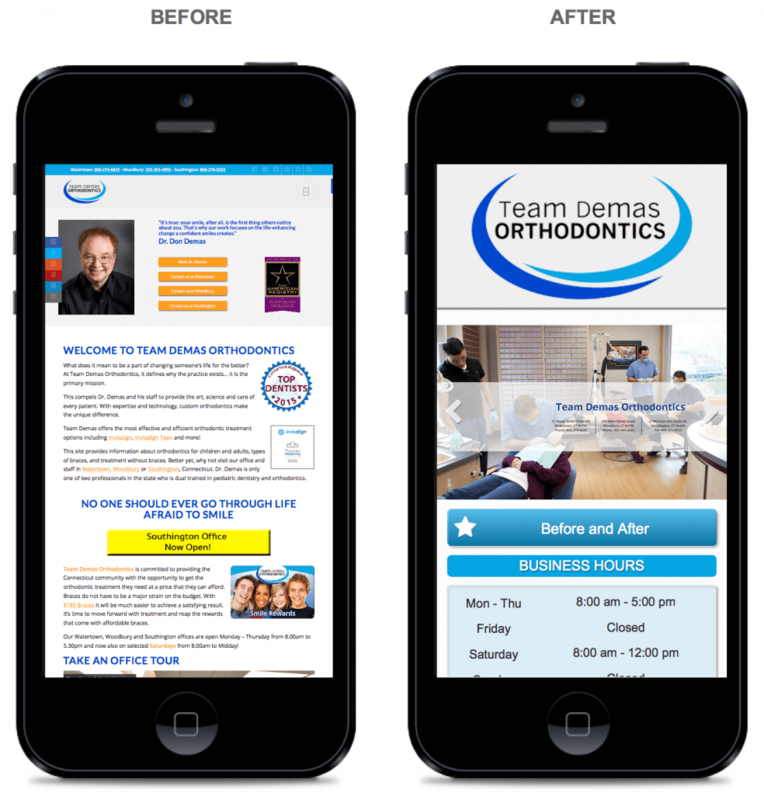 After – On the right example above, after being built for mobile devices, you will notice how much easier it is to navigate through the site on a smaller screen. This ease of navigation and other functions increase conversions and in turn your ROI. Websites are designed and built for desktop computers in landscape mode. With over 60% of all searches now made on a mobile device it’s essential to have a dedicated mobile website designed and built with the end device in mind which is viewed in portrait mode. One click phone numbers and easier navigation on a small screen are just two of the major design features incorporated in to winning mobile design. These functions also help to increase conversions and generate a higher ROI for businesses investing in their future. Not only will your website be bulletproof from Google’s mobile friendly update but your fully optimized, custom mobile website will generate More Traffic, More Conversions and More Sales. Take the opportunity to get the competitive edge and catch-up with the mobile revolution. DON’T GET LEFT BEHIND! There is some GOOD NEWS! Whilst it is TRUE that if your website is NOT Mobile friendly you will NOT be found in mobile search… AND 73% of ALL SEARCHES ARE MOBILE SEARCHES…. 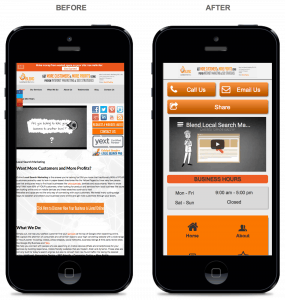 ONLY 20% of ALL companies ARE currently mobile friendly. This is a GREAT OPPORTUNITY to BEAT YOUR COMPETITION! We are here to help you. As a full service digital marketing and Local SEO agency, Blend Local Search Marketing knows how to make your business visible in search and convert visitors to customers. Let Blend Local Search Marketing keep your business aligned with Google algorithm changes and visible to all the prospects searching for your products and services via mobile devices. 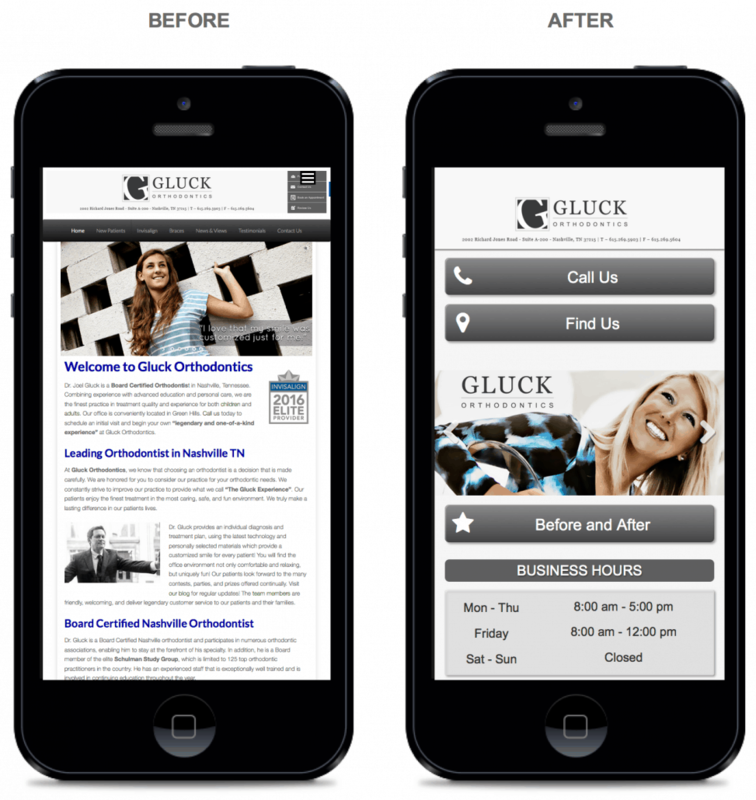 Let’s make your site Mobile Friendly Today! Advanced Integration: Including: Google Maps, Facebook, YouTube, Twitter and even PayPal. Full Analytics: Take out all the guess work out of who and where your mobile visitors are coming from by logging into your personalized dashboard. All inquiries, please contact us here. We take secure payments by Paypal and leading credit/debit cards.